Casta Diva, Turandot’s new neighbor on Tverskoi Bulvar, has a name also drawn from operatic legend. In the aria from Vincenzo Bellini’s Norma, the Druid high priestess calls upon the Casta Diva, or Chaste Goddess (the moon), to bestow peace upon Gaul. For restaurateur Andrey Dellos, it appears that the mood of the aria inspired the decor of his new restaurant. (Google Casta Diva and Maria Callas, pictured above, to get the idea.) Set like a Gallic temple within a moonlit oak grove, Dellos has provided Casta Diva with the same theatrical attention to detail that characterizes Turandot. 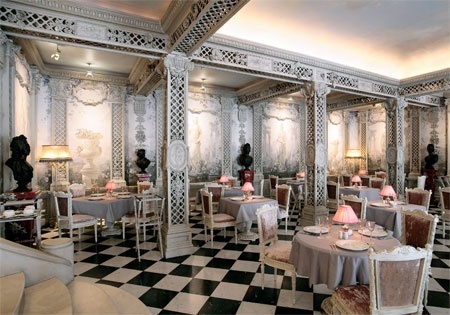 Occupying two floors, the tables of Casta Diva are amply spaced and served by attentive waitstaff, clad in black jackets and bright red neckties that wrap the narrow, upturned wing collars of their white shirts. 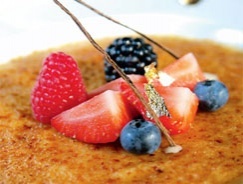 Executive Chef Michele Brogioni, a veteran of Tuscany’s Michelin-starred Relais Il Falconiere, leads the kitchen. His menu is extensive with a dozen headings from antipasti and hot antipasti to pizza, grilled meats, and desserts. The wine list is heavy on Italian though there are a couple of pages of French and New World. It includes an Antinori Cervaro Castello della Sala Estate Chardonnay (7500r) (see a review of this wine in Passport’s October issue) as well as the more modestly priced Bramito del Cervo Chardonnay (2160r) from the same winery, a good budget choice. Sommelier Sergei Aksyonovsky suggested Palari Faro 2004 (9600r) made from Nerello Mascalese grapes and raved about Passopisciaro 2005 (6750r), a Burgundian style wine from the same varietal. Before going further, it should be stated that the pizza was a big hit. It seems Casta Diva has its own Italian pizza chef, David Mauro, winner of a “Best Pizza in Europe” award. While waiting for some late-arriving dinner companions, we tested the pizza oven with an order of Pizza con Tartufo Nero (720r) and a request to supplement the black truffles with some thin prosciutto. Quickly devoured with raves all around, we couldn’t help repeating the pizza late in the meal, this time with a few slices of white truffles carefully weighed by the waiter at the table. 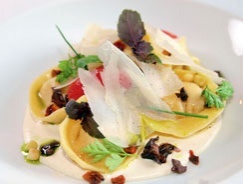 I scanned Chef Brogioni’s menu for intriguing items like the Mushroom Soup with Meat Ravioli and Burrata (590r). For hot antipasti, I zeroed in on Cannelloni with Duck and Ricotta (575r) and under homemade pasta picked the Ravioli with Burrata, Tomato and Pine Nut (825r), passing over the Risotto with Hazelnuts and Ceps (850r), which I would have loved to have tried. 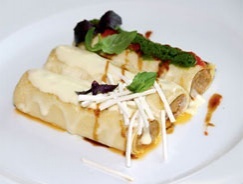 The cannelloni consisted of two generous pieces filled with fullflavored, dark duck finely blended to a paste, covered with a rich parmesan cream sauce. The Ravioli with Burrata followed, a wonderful combination, the al dente pasta opening up to the soft, delicate Burrata cheese. For a main course I selected Costalette di Agnello “Scottadito” (1180r), or sizzling lamb chops. Scottadito means finger-blistering, which in this context means three seared chops so meaty and good that you can’t resist picking them up hot off the grill. For dessert, we shared a rich and delicate Tira Misu with Wildberry (490r) and two rounds of Limoncello. The fabulous pizza aside, the presentation and quality of preparation at Casta Diva was exquisite and the service very good, certainly as good as any of the other Italian chef restaurants in Moscow. Though deserving of high marks indeed, Casta Diva still fell short on Italian ambiance, something that few if any restaurants in Moscow have yet been able to import. We are still waiting for our Maria Callas.